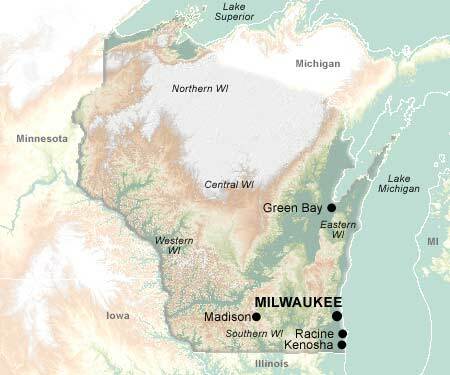 The Wisconsin region was first explored for France by Jean Nicolet, who landed at Green Bay in 1634. Great Britain obtained the region in settlement of the French and Indian Wars in 1763; the U.S. acquired it in 1783 after the Revolutionary War, but Great Britain retained actual control until after the War of 1812. The region was successively governed as part of the territories of Indiana, Illinois, and Michigan between 1800 and 1836, when it became a separate territory. Wisconsin was admitted as the 30th state in 1848. Known as the "Badger State", Wisconsin ranks 26th in size, encompassing 56,154 square miles. The capital, Madison, and the largest city, Milwaukee, are located in the South Region, the most populous area of Wisconsin. Just south of Milwaukee, on Highway 50, are the cities of Racine and Kenosha. On Highway 50 north of Milwaukee is the city of Green Bay, home of the Green Bay Packers of professional football fame. Lake Winnebago is the largest of Wisconsin's 14,000 lakes. Water sports, ice-boating, and fishing are popular, as are skiing and hunting. Public parks and forests take up one-seventh of the land, with 45 state parks, 9 state forests, 14 state trails, 3 recreational areas, and 2 national forests. Among the many points of interest are the Apostle Islands National Lakeshore; Ice Age National Scientific Reserve; the Circus World Museum at Baraboo; the Wolf, St. Croix, and Lower St. Croix St. Croix National Scenic Riverway ; and the Wisconsin Dells. Prominent Wisconsinites: actors Don Ameche, Spencer Tracy, and Orson Welles; musicians Woody Herman, Les Paul, and Liberace; architect Frank Lloyd Wright; magician Harry Houdini; author Thornton Wilder; seer Jeanne Dixon.